TWO PERSONS FOUND DEAD AT THE MIDLAND HOTEL. 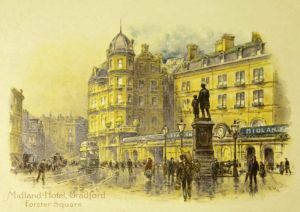 A discovery which created some consternation among the members of the staff and the residents was made at a late hour last Friday night (10th August) at the Midland Hotel, Bradford. 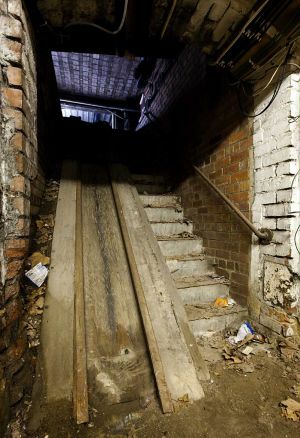 At about a quarter to twelve a page boy named Alfred Ruddock went to the lavatory in the basement of the building and was horrified at finding a human foot projecting from the bottom of the service lift, which is close by. He at once rushed up in a terrible state of alarm and informed several members of the staff at the shocking discovery he had made. 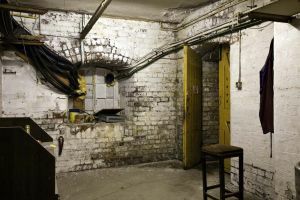 On becoming acquainted with the nature of the discovery the sub manager caused investigations to be made, with the result that the bruised and disfigured remains of two members of the staff were found lying in the bottom of the lift. One of these was, on examination, found to be the body of George F Schelter, a young Bavarian of about 17 years of age, who had been employed for about a fortnight as junior waiter, and the other was that of Rose Penistan, who for a period of about six months had held the position of second still room maid. Both persons had been missed at about a quarter past ten o’ clock in the evening, and had not been seen for about an hour, but there does not appear to have been any suspicion aroused by their absence. It was about an hour later that Ruddock made the shocking discovery in the basement. 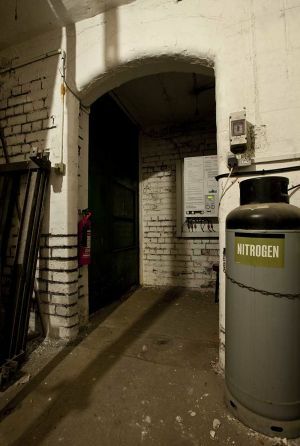 It is supposed that Schelter and Penistan were sitting together on the edge of the barrier by which the well of the lift is guarded, and by some means they lost their balance and fell into the basement. This is the most probable hypothesis, as if they were to sit down in the room this would be the most convenient place, and if they were to overbalance they would fall to the bottom. Or it is just possible that they were dragged down by the descending lift. The distance from the still room floor to the basement is about 32feet. 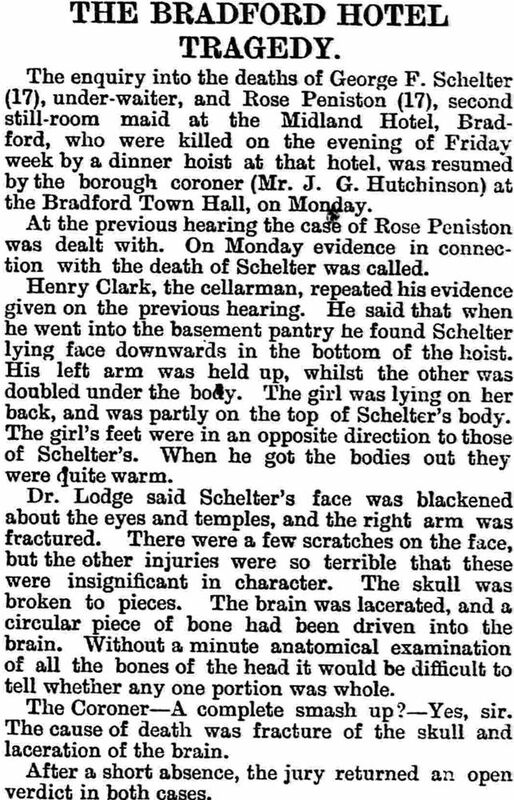 One of Schelter’s arms was broken and both he and Penistan had sustained terrible injuries to the head. The police were communicated with on the nature of the discovery becoming known. The body of the late Rose Penistan, who was killed at the Midland Hotel on Saturday, by falling down the hoist from the still room, was identified on Monday at the mortuary by Mrs Penistan and her son and daughter. Mrs Penistan, it appears, is susceptible to fits, and the sight of her daughter had such an effect upon her that she had to be forcibly held down for some minutes by four persons. 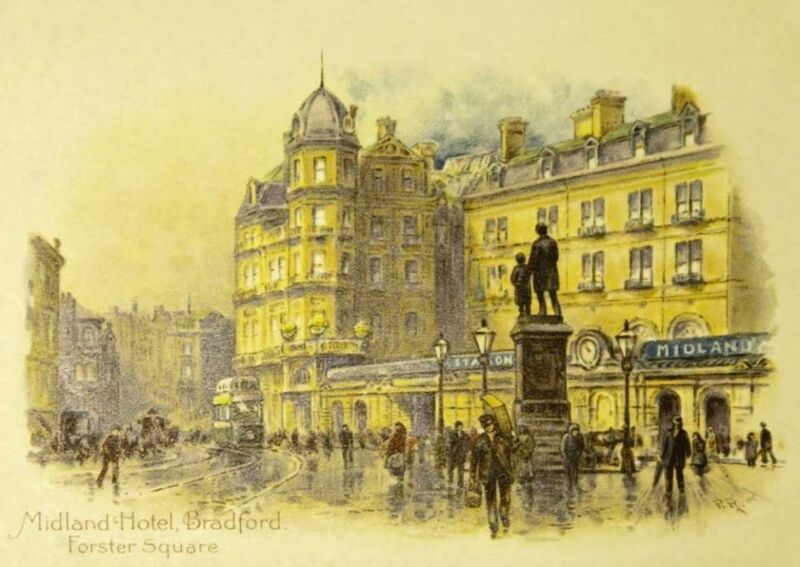 At the Bradford Town Hall on Monday 13, August, the Borough Coroner (Mr J G Hutchinson) held an inquest on Rose Penistan (17) still room maid, and George F Shelter (17) , waiter, both employed and residing till Friday night last, at the Midland Hotel, where they were killed by the dinner hoist. The jury were sworn, and then proceeded to view the scene of the fatality. The jury, after their visit to the Midland Hotel, drove to the various places where the other bodies were awaiting their view. They were away more than an hour, and it was nearly half past four before they returned and commenced the inquest. Mr Young (Messrs Beale & Co., Birmingham) watched the case for the Midland Railway Company, and Mr John Waugh, C.E,. (retained by the Coroner) was also in attendance. Mr Young at the outset expressed on behalf of the Midland Company and Mr Towle, their hotel manager, their regret at the occurrence, and their sympathy with the relatives of the deceased. John Penistan, 11 Newton Street, Lincoln, said he was a plumber and the deceased woman was his sister. She was 17 years old, and was a domestic servant. She had, he thought, been at the Midland Hotel since May last. He had seen her dead body today in the public mortuary. Alfred Ruddock, hoist attendant at the Midland Hotel, said he had charge of the passenger lift. He found the bodies of the deceased persons on Friday night about 11.45. They were in the basement pantry at the bottom of the house. The hoist in question was the dinner lift. Just tell me what you discovered? – I had gone into the pantry with an empty plate, which I’d had my supper on and I was turning round to come out when I was startled by seeing a foot, under the hoist, and I could not stir for a moment, sir, with the fright, and I could not scream. What did you do then? – I gave information to Clarke, the cellar man. What did he do? – He went to look, and said to me “it’s right, go tell someone,” and I went and told one of the porters. Continuing, witness said that by the manager’s directions information and was given to the police, who removed the bodies in the ambulance. How long before had you seen the young woman? – In the morning, sir. – Not since the morning? – No, sir. Have you any information, or do you know how the bodies got into the position in which they were found? No, sir. 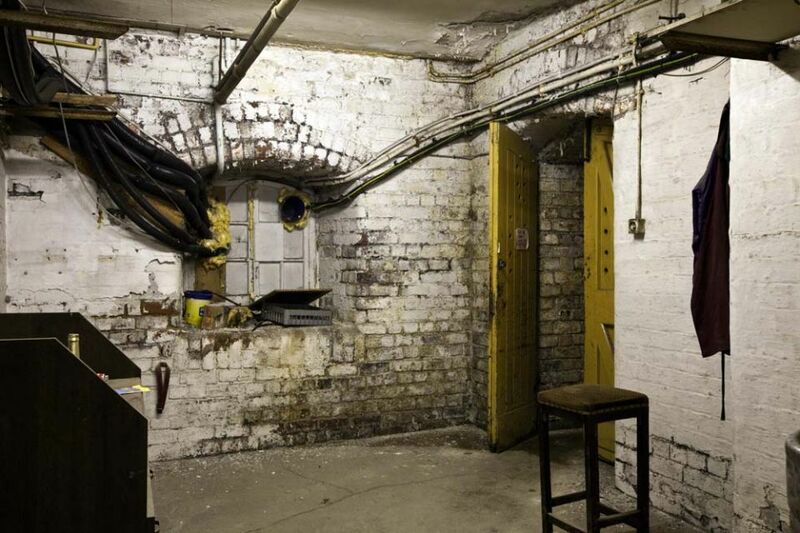 Henry Clarke, cellar man at the Midland Hotel, said on Friday night, in consequence of what Ruddock said to him, he went into the basement pantry. He saw a man’s foot protruding from the bottom of the door at the side of the dinner lift. As soon as he saw the feet, he sent the cage of the lift up and then leant over to feel for the young man and I was horrified to find that there was also a young woman there. The only light was that from the electric light in the station. There were two pails at the bottom of the lift, and the young man was laid on one, and the girl was partly on her side and partly on the other pail. The girl’s feet were in an opposite direction to those of the young man. 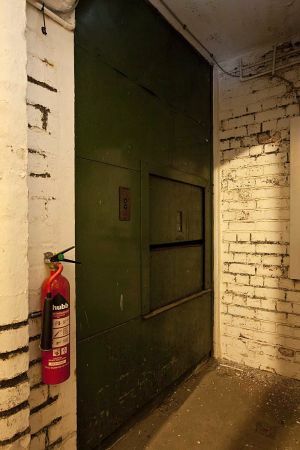 The cage of the lift was close upon the bodies. Witness shouted out to Ruddock to fetch help. The manager came, and with assistance he got the bodies out. Had you seen Rose that day? _ Yes I saw her about six o clock in the still room. So far as you know had the man any duties requiring him to be in the pantry, or still room? – His duties were in the coffee room, sir. The Coroner: in your bedroom could you hear if the hoist was worked? – Yes sir. Did you hear it worked after you went to bed? – No, sir. Did you hear any noise in the hoist well? – No, sir. The Foreman: I should like to ask if they were missed any length of time? Witness said he had not seen the girl after six o clock, and he had not seen the man for two or three days, and did not know he was missing. Mr William O Audinwood, resident manager of the Midland Hotel, said the deceased was second still room maid. She had been at the hotel since the middle of May. In connection with her duties, would she have to work the service hoist? – it would be impossible to work it from the still room, sir. It would be no part of her duties? – No, sir. Where was she principally employed? – All her duties were confined to the still room. Now, referring to Friday. When did you last see her before her body was found? – I was in the still room a few minutes before ten o’ clock. Now, was George Schelter a waiter? – Junior coffee room waiter, sir. How long had he been at the hotel? – About a fortnight, sir. Were you aware of him being at all acquainted with the deceased other than as a fellow servant? – No, sir. Had the deceased girl a box at the hotel, or any place for private papers? – A box in her bedroom. What time was it when you got into the pantry? – About a quarter to twelve, sir. Who called you? – well the rushing of two porters past the hall drew my attention. I was sitting in my office. What did you find when you got there? – at the bottom of the lift I saw two bodies. Now give me the position of the woman first? – I couldn’t give the exact position, sir; I ran upstairs to telephone to the Town Hall. Continuing, witness said that the feet of the man were right underneath the hoist lever, and the feet of girl were in the opposite direction. In reply to further questions, witness said the clothes of both the deceased persons appeared to be in order. On Friday night it was the head still room maid’s evening off, and the deceased girl would be on duty from six to twelve, so that in the ordinary course of things she would be alone in the still room. When you were in the still room there was no one else there? – No there was a waiter just going into the coffee room from the still room. By Mr Young: What would be the effect of a person striking the hoist lever in falling down the shaft? – it would be to bring the cage down. Coroner: Where did you find the slipper? – On a small platform, level with the ground floor, half way between the still room floor and the basement. Did you find any marks on the walls? – Down the front of the lift there were many scratches on the woodwork. And did those appear to be recent? – Yes, sir. Florence Ryalls, head still room maid at the Midland Hotel, said that the deceased girl worked under her. She last saw her alive at six o clock on Friday evening, when she left her alone in the still room. 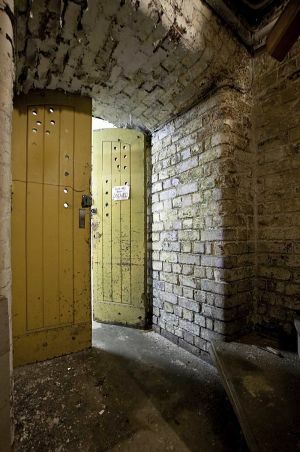 Witness returned at five minutes to eleven and went to the still room, but there was no-one there. Witness asked the waiter on duty where she was, and he replied that he had not seen her since 10 o’ clock. Joseph Engieler, a waiter at the Midland Hotel, said his duties were in the coffee room, and he knew the deceased. On Friday night he was on duty from eight o’ clock to twelve. He last saw Schelter alive about ten o’ clock, when he was just coming from the coffee room into the still room. He was going there with some butter dishes. The deceased girl was there, and witness left them there together, because he had to go into the coffee room. She was at the table, and he was on the other side putting the butter dishes away. Did you as a fact see either of them afterwards alive? – No, sir. How soon after that did you go into the still room? Did you inquire for the maid? – Not just then; I was able to manage by myself: but I made inquiries for Schelter a little later, but could learn nothing of him. Have you at any time noticed any familiarity between them? – No, sir. Mr. John Waugh, C.E. said he had examined the hoist, which was a hydraulic one and double as far as the still room. The distance which the two deceased persons were supposed to have fallen was 29 feet. It was difficult to understand how two persons could sit on the barrier in the hoist opening, which was only 2ft 3 in wide. It was also difficult to understand how two persons could fall down the shaft together. The circumstances must have been extraordinary, such as might be represented by two persons skylarking on the edge of a precipice. He had worked the hoist that morning, and it appeared to be in good working order. It was one of the very best construction. Its working conditions were those which were usual in this class of hoist. Mr Waugh added: – “The question arises, could not the opening be closed automatically by the cage, or vice versa? This arrangement has been very successfully applied in the case of hoists used by passengers or employees in our factories and workshops. It has also been tried for service lifts, and with this result, that the opening is being closed as the cage ascends or descends and that those who are taking out or putting something into the cage are very liable to be caught in a sort of double guillotine; and accidents have occurred in this way. Mr Young: On behalf of the company I can only say that if some engineer could contrive something which would make accidents impossible we should be very glad to adopt it. Mr Samuel.Lodge, police surgeon, said he had made a post mortem examination, in company with Dr James, Dr White and Dr Muatt, of the bodies. He found that the deceased girl Penistan had received a fracture of the skull and the breastbone. Death must have been instantaneous. 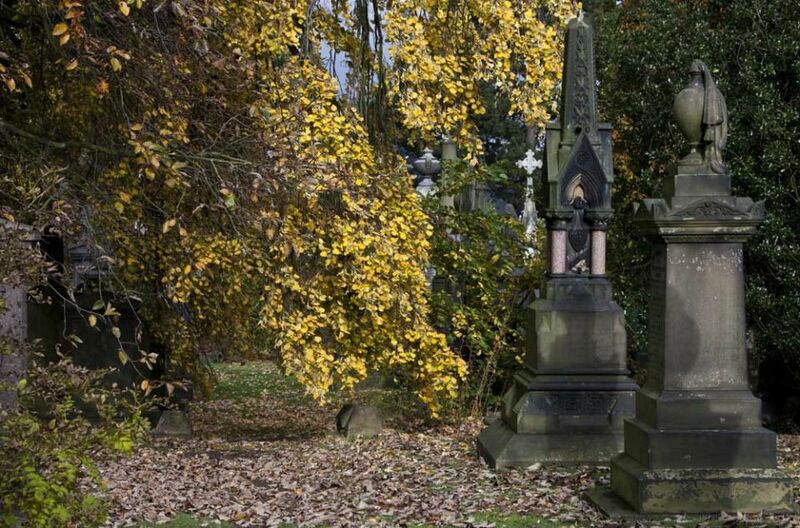 Inspector Ackroyd and Thomas Morrison, a waiter also gave evidence. The Coroner then intimated that he would adjourn the further hearing of the case for a week. 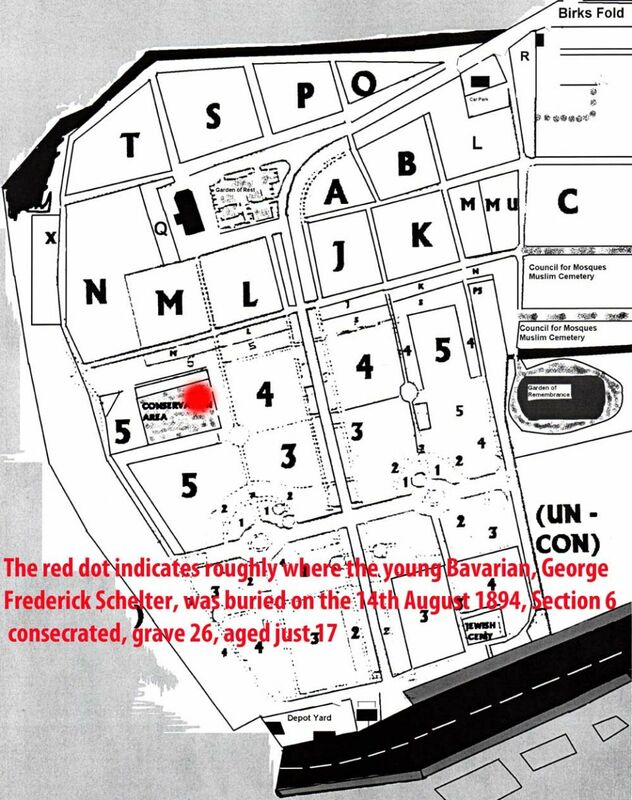 Formal evidence of the identity of the deceased George F Schelter was then taken. 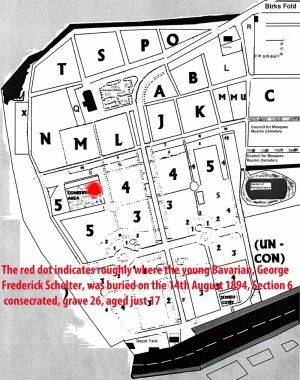 A distant relative named George Hermann, of 44 Hampstead Street stated that the deceased came from Nuremberg, Bavaria and had been in England about five months. The inquest was then adjourned until Monday next. 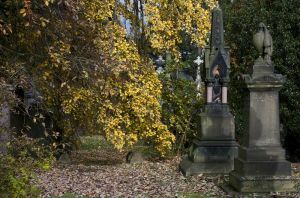 The remains of George F Schelter, the waiter at the Midland Hotel, who was killed by the hoist accident on Friday, were interred on Tuesday August 14, at Scholemoor Cemetery. The cost, we understand, is defrayed by the Railway Company. The body of the girl Penistan has been removed to Lincolnshire for interment. 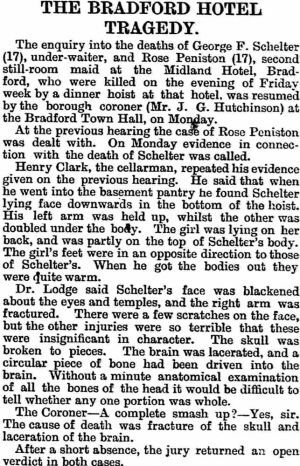 The enquiry into the deaths of George F. Schelter (17) under-waiter, and Rose Peniston (17), second still-room maid at the Midland Hotel, Bradford, who were killed on the evening of Friday week by a dinner hoist at that hotel, was resumed by the borough coroner (Mr. J. G. Hutchinson) at the Bradford Town Hall, on Monday. At the previous hearing the case of Rose Peniston was dealt with. On Monday evidence in connection with the death of Schelter was called. Dr. Lodge said Schelter’s face was blackened about the eyes and temples, and the right arm was fractured. There was a few scratches on the face, but the other injuries were so terrible that these were insignificant in character. The skull was broken to pieces. The brain was lacerated, and a circular piece of bone had been driven into the brain. Without a minute anatomical examination of all the bones of the head it would be difficult to tell whether any one portion was whole. The Coroner – A complete smash up? – Yes, sir. The cause of death was fracture of the skull and laceration of the brain. After a short absence, the jury returned an open verdict in both cases.